This guy actually brings to mind Rick from the oh-so-excellent The Young Ones…. 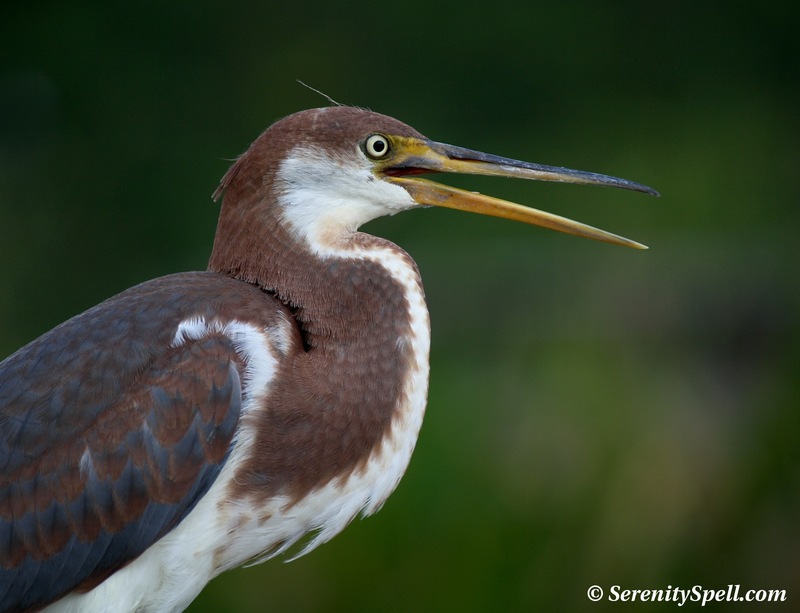 The Tricolored Heron (Egretta tricolor) was formerly known as the Louisiana Heron, as it was one of the most abundant herons found in the Deep South. 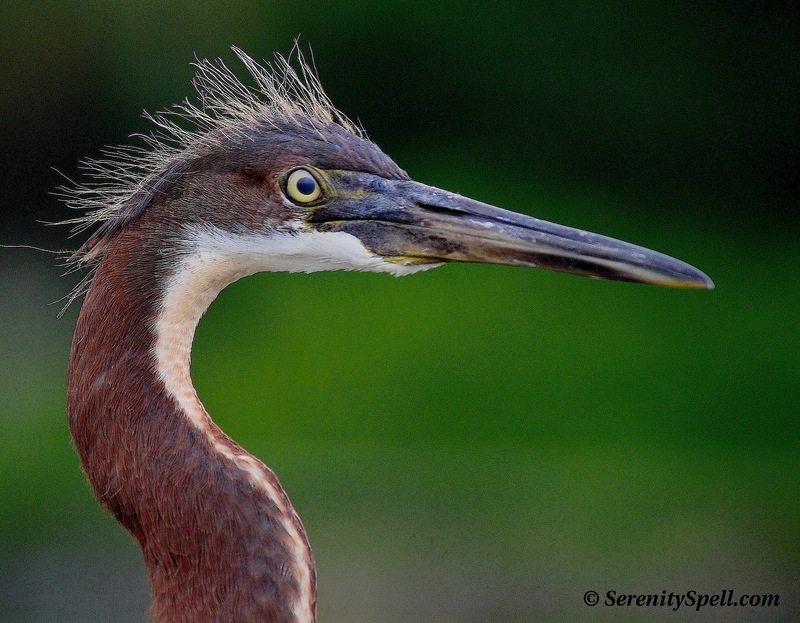 It’s a medium-sized and slender heron that lives in the southeastern United States (but as far north as coastal New Jersey), Central America, and the Caribbean. Standing approximately 22 inches tall on long yellow legs, this heron’s wingspan reaches 3 feet. Beautiful slate blue feathers cover most of its body, save a white-striped chest and belly, and a rust-colored neck. The eyes of the juveniles are a yellowish-white, turning brown with pink inner margins as they age. Males and females of the species look alike. During courtship, these already beautifully colored herons become even more vibrant: the eyes turn a lovely and striking scarlet, and their otherwise long, pointed yellow bill turns blue. Breeding plumage involves filamentous plumes on the head and neck, and buff plumes on the back. This seemingly peeved Tricolored (such a face, sweetheart!) — despite my distance with a telephoto — is a juvenile, as is the second heron. Their natural habitats are swamps, marshes, bayous, lagoons, and coastal ponds. It’s a common sight in our wetlands to see them nesting in colonies, in the trees and shrubs, with other herons. The male selects the nesting location, and builds the nest with the female. As with other herons, both parents care for the chicks, feeding them regurgitated food. Tricoloreds stalk their prey in the shallow waters, looking for fish, crustaceans, reptiles, and insects. They’ve been known to delve into the deeper waters however, with only their bodies visible. These herons are the favorites of many in our area, and are a great joy to watch…. But like so many other species, despite their non-threatened status, they’re losing their natural habitats. It’s truly our duty to protect and preserve these complex ecosystems not just for the flora and fauna they are home to, but for ourselves. Thanks so much! These guys are fun, very lovely. Lovely! I learn something with each blog. We don’t have these in Oregon so I’m not too familiar with them…now, I must see one in person. Thanks much — I’m so glad! Yep, these guys are definitely Southern herons. 🙂 They’re lovely, though. I’m going to post the adults soon, and one in breeding colors. So striking!